Alveolar process a.k.a. processus alveolaris protrudes from the inferior surface of the body of the bone under the plane of the palatal process. Alveolar process creates a curved shape, with the alveolar arch, its equivalent of the opposite side, in which the roots of the teeth of the maxilla are rooted within sockets or alveoli. Generally, each alveolar process holds eight teeth once dentition is finished in a fully grown adult. Generally, two small vascular foramina are present at the back of the incisor teeth, penetrating the medial surface of the alveolar border. The alveoli become absorbed whenever any or all the teeth are dropped as well as the alveolar process may be reduced towards the level of the plane of the palatine process under these circumstances. Under the maxillary tuberosity of the body posteriorly the alveolar process terminates and anteriorly it shares the creation of the intermaxillary suture. From the molar along with premolar region towards the area of the upper incisors, alveolar process constitutes an anterior and inferior prolongation of the basal arch of the maxilla. In adults, the inferior surface of the alveolar process has the inlets for eight alveoli which are divided from one another by interalveolar septa. The alveoli for the incisors end in a convex bony margin corresponding to the concave enamel borders of the homonymous teeth. The sides of the canine alveoli merge at the palatal part. The alveoli of the premolars are elliptical along with a buccopalatal major axis. The alveoli of the molars are not straight cavities but are usually concave posteriorly. The canine teeth and incisors have a single root. The premolars generally have two roots, one palatal and one buccal, each with its own socket. The molar teeth generally have one palatal along with two buccal root sockets outlined by interradicular septa. The molar alveoli resemble a rectangle with an elongated buccal side and a rounded palatine side in general shape. At their bases, both the inter-radicular as well as interalveolar septa are thicker and narrow inferiorly. A mesiodistal interradicular septum is always present for the alveoli of the molars which make a single minor socket for the palatal root. Occasionally at the alveolar margin, the interradicular septa are entirely perforated. The alveolar process of the maxilla creates a protrusion of cancellous bone referred to as the retromolar tubercle or retromolar triangle of the maxilla at the alveolus of the third molar (wisdom tooth). Through remodelling, the alveolar bone may become displaced in relation to the remaining alveolar process, thereby allowing tooth movement to take place. Difficulty in the continuity of the lamina dura in the apical region of an alveolus are significant in diagnosing the radiographic identification of periapical lesions. 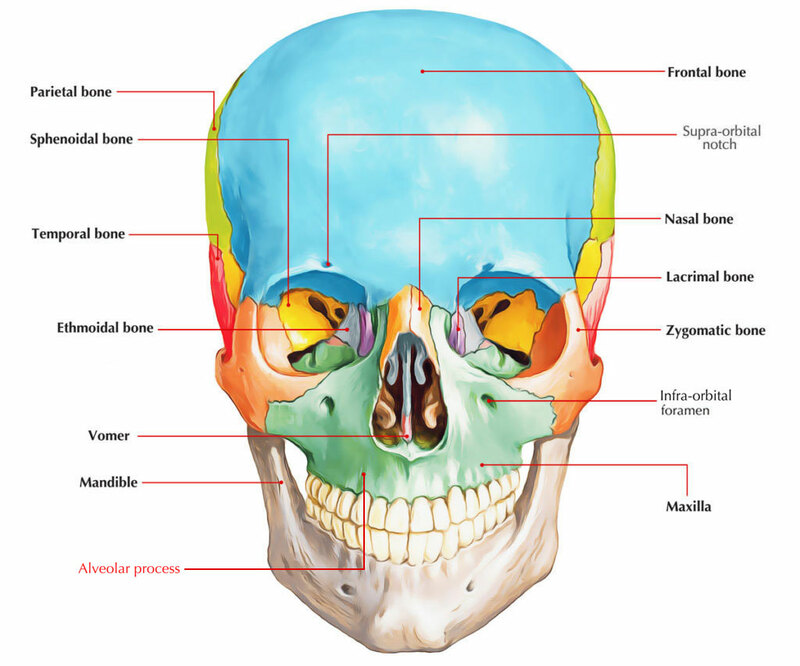 The proximity of the alveolar bone to sinus cavities or major nerves (mandibular nerve) may give rise to problems during tooth extraction or surgical interventions. Following tooth extraction, the alveolar process tends to resorb, a development that may compromise the placement of endosseous dental implants and affect the construction of removable prostheses.